It’s been a great drawing day because I had enough time to complete Waiting . . . it took three hours to work on the Heron and several last touches on the water and sea-foam. Waiting was drawn on Strathmore Bristol Vellum (9×8). Graphite pencils for their reflective power (4H, 2H, HB, B, 3B and 6B) were used on the sky, rocks and water, and Carbon (B and 6B) was used for the Heron because it’s a softer lead and flat – my goal here was to create a 3-D look so the Heron didn’t blend in to the background water. Blending tools were tortilum and a tiny piece of felt. Thank you for sticking with the project over these last eight weeks – it was an exciting subject to draw. Who knew that water could be represented so well with graphite? The reference image used was from Fiana Gerzon a wonderful photographer from pmp. This entry was posted in Drawings, Thursday Drawings and tagged carbon, drawing, graphite, Seascape. Bookmark the permalink. Ah, Mary, you did a fabulous artwork!! Congratulations! 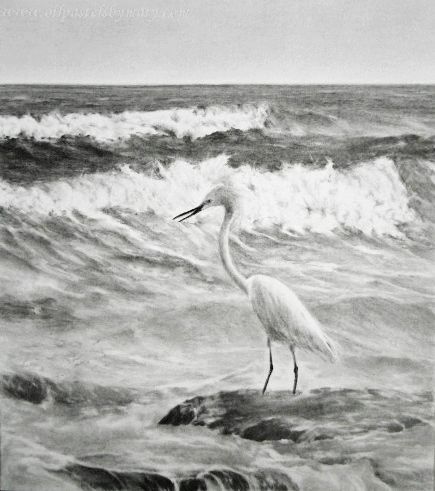 Thanks for using my photograph “The Lonely Heron #2” as reference for your wonderful drawing! The Heron is really in 3- D and everybody could feel the energy of the ocean in your masterpiece. Thank you very much , Mary for sharing with us something new -the process of the drawing the ocean and waterbirds in the graphite and carbon. I was lucky to have caught that perfect moment when the waves were crashing and a Heron was still and looking directly to the ocean. Because before that shot the Heron was moving all the time (being afraid of me)… I spent a few hours and made many, many shots..
. Some of them were the best! It was worth to wait!. I’m really happy that so many people have painted my Lonely Heron photograph. So wonderful to see you here Fiana! Thank you so much for your beautiful comments – they’ve made my day. You caught the most remarkable photograph that worked beautifully in graphite as a drawing – so happy that you had the patience to wait out the Egret. Love it – thank you for sharing. Worth the wait! You capture the heron’s natural grace very well. Thank you for sharing eight weeks of work. Thank you Evelyne for your lovely comment! This is fantastic Mary! And who knew graphite could represent water so well! It is all your talent! Thank you so much Susan! It was one of those relaxing projects, really enjoyed myself with this one – lots of discoveries. Thanks again! Thanks Jackie so much – glad you stuck with me on this one. I’m enjoying it and if it rains later today I may be able to get some painting in (yeah!). Thank you Maria, means a lot! Oh! I like this, Mary. Probably my favorite of your graphite pieces. I like the way the bird is just able to come out of the background. It has sort of a now you see me, now you don’t effect on me. I like that very much. All the different passages of value on the water are so interesting. Wow Leslie, thank you so much for your compliment! Appreciate your feedback on the water and the Heron and yes you got it the right, the side of the head sort of blends in with the water (lost/found edging) that worked in bringing the rest of the bird into view. Loved working this scene. Worth the waiting. I’m intrigued by the evolution of your drawing – an interesting process, as you were evidently being guided by source material, of which we, as onlookers, were unfamiliar. Each layer was a new revelation, akin to going on a trip to a new place with an experienced guide. Your evocations of sea foam and tumbling surf are a wonder. Very nicely rendered! Wish I was there to soak it in with all my senses. Thank you very much for your nice comment and feedback Rich. I’m glad you enjoyed the process and scene of the sea feeding us with her richness – drawing it was a great pleasure for me. Thanks again – have a wonderful weekend. Wow – this is stunning work! Thank you Lady for being so generous! A triumph! As special as the heron itself. Oh, that’s so beautiful. Thank you. Thank you Marcus for your kind comment! An absolute master piece Mary! There is so much motion and turbulence radiating from the scene, is magical how in all that you managed to “suspend” time by placing the Heron in the mids of it! Your mastery of tools is flawless and produced stunning effects, values, contrasts and the most impressive water transparency I have ever seen done with graphite! Outstanding and one of the most beautiful and one of my favorites for sure! Congratulations to you! How can I thank you for such feedback and gracious comments – very hard to explain what it means to read your thoughts on this piece. There is no explaining the sea and it’s mesmerizing effect it has on so many – the draw and awe of sheer power is very hard to ignore and perhaps this is my reason for having it as one of my main subjects. This particularly drawing showed me the way – several ideas are bubbling. Thanks again Eva for being so inspiring. Thank you for graciously sharing all your beautiful works of art with us to enjoy and inspiring us as well! No blending. None at all. 🙂 The water is a TRIUMPH !!! GOODONYER clever Mary. Thank you M.R. – so glad you enjoyed the lack of blending (lol)!! Have a great weekend!! This is so good I cannot find words. Thank you so much Dorann – you said it all. Many thanks and have a wonderful weekend! Wonderful drawing Mary! I love how the Heron pops! Excellent value work and the ocean is so beautiful! Bravo!!! Thanks Rhonda – love it that you noticed the Heron. Cool right? I lost a lot of sleep trying to think through that process, because once the carbon goes down you are kind of stuck with it and I didn’t want to ruin the spot-free area. Thank you for your generous comments! A great study in edges, hard and disappearing….and values, contrasting and adjacent. Congratulations, Mary! Thank you Cynthia, doesn’t surprise me that you noticed the nuances – that makes my day! Glad you enjoyed the process, always starts out slow but then the momentum grows and the finale is like fireworks. 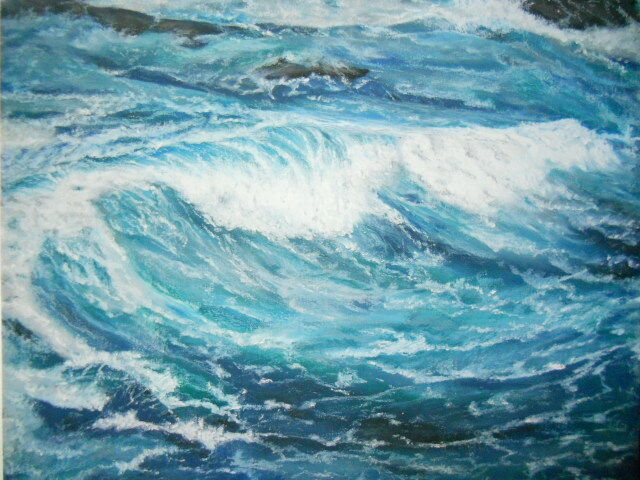 It was a great project and I think there will be another seascape . . . stay tuned. Thank you so much Marina, this drawing taught me a lot I really appreciate that you are- always there, cheering me on. I was surprised at how much fun it was to draw the sea – have a wonderful weekend! Mary all I can see is wow! I can feel how the Heron feels the water, this is beautiful, the texture of the waves and the water, not to mention the texture of the heron. Bravo! Thank you so much Doris for your encouraging comment. Talk about feeling, that’s exactly what was going on while drawing this scene, I could feel the waves and energy of the water – especially the Heron as he patiently waited for his dinner. Exactly, this drawing made me feel, that is the word, did not know how to describe it. How did you do the white of the wave, with white charcoal pencil? The sea-foam was done by first laying down frisket to protect the white while I worked on the water. Once done the frisket was removed by pulling it off and then the entire sea-foam area was done by smudging strategically with the tip of a tortilum that had with 2H (and a little of HB for deeper areas and shadows). After the sea-foam was formed I went back into the water that surrounded the sea-foam and using lost and found edging technique to lay in darks as shadows at various places to establish edges of the sea-foam and a 3-d look. Hope that I explained it okay. Yes, it did, thank you very much Mary, I am learning. Same here Doris, always something new that makes the process exciting to try. Thanks ~ was the best thing that Z did for Time Out For Art on Thursdays. What a masterpiece! You’re amazing! Thank you Eva, you are very kind! Mary, this is fabulous. I am in awe. I hope some day to do waves and foam so well. Mary, this is just beautiful. This turned out great! And the Heron stands out beautifully. It was worth the wait to see the final piece, Mary. Thank you Janell very much! I was most nervous about the Heron, thanks for mentioning.